First party cookies can be created using CNAME record. Only by setting the FP cookie the visitor ID cookie from s_vi can be read, and can be passed to other variables. Using third party cookie s_vi cannot be read (unless getVID plugin is used), and hence cannot be passed to any variable, or to visitorID for cross domain tracking. I tried experimenting FP it worked for me, I was able to read the visitor ID into an eVar (v3). I had to research a little to get this done, thought of sharing this piece of information……. I made a post in my client (NAM) blog today, I am replicating it here for your goodness. 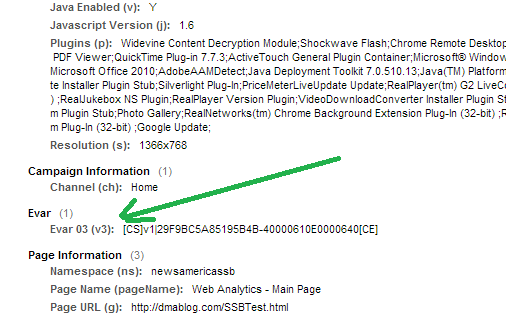 See it live : http://dmablog.com/SSBTest.html – Please use chrome debugger or any packet analyzers. I used kamal1 in place of metrics You can use any name as long as it points to the SC DCS.